When I was 12 my Dad asked me what I wanted for my special birthday night meal. I guess he expected me to say pizza, or some other kind of junk food. What I actually asked for is Beef in Red Wine sauce, a casserole that cooked in the oven for hours emitting wonderful smells into the house. I don’t actually know the recipe my Dad used for that meal – but I’ll be sure to ask him next time I see him. It’s been years since I’ve had Beef in Red Wine Sauce, then this week I saw Lindaraxa’s recipe was one of the most viewed on CookEatShare for a simplified version of Julia Child’s Boeuf Bourguignon I knew I had to try it. Having never seen the original recipe even the simplified recipe looked quite complicated to me. You have to cook it on the stove, put it in the oven, take it back out, leave to rest and then put on for final cook. That’s fine for a long Sunday afternoon, but what about a Thursday night – or a Saturday lunch? 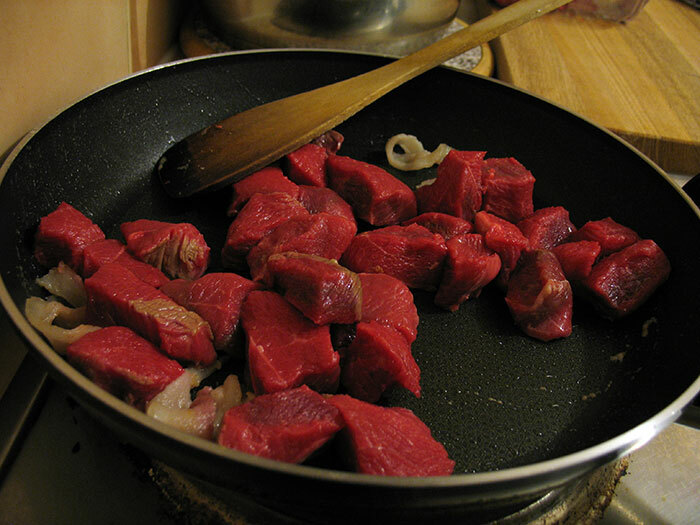 The original Beef Bourguigon recipe was a recipe made by French peasants to tenderise tough cuts of meat, but I know another a great way of tenderising meat. Slow Cooking. Enjoy, and as if you needed anymore encouragement – get that Slow Cooker or Crock Pot out the back of the cupboard. 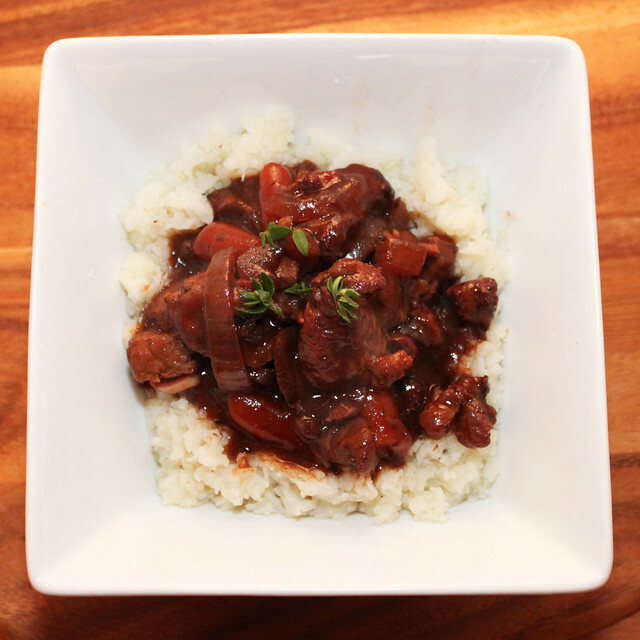 ~ based on Simplified Boeuf Bourguignon. Originally from Julia Child. Use your crock pot or slow-cooker to make this slow cooked beef bourguignon – a simplified version of Julia Child’s classic dish. Preparation Time: 30 min (45 if you need to peel the small onions). Cooking Time: 8 hours, plus 20 minutes to reheat (or if necessary 10 minutes to thicken the sauce). 500 grams of cubed beef, suitable for a casserole. I used rump steak. 2 cloves of garlic, pureed. 2 Bay Leaves. The recipe I used suggested crumbling them, I would advise against this. I did this the first time and I got left with crumbled bay leaf in my mouth – which was not great. 10 – 18 small white onions. These small onions are hard to get hold of in the UK, they are the ones used for pickling onions. I used shallots instead which are much bigger, and I used two per person, after choosing the smallest I could find. If you know Julia Childs recipe you will see that I have cut out some of the ingredients, the extra butter and cognac, you can add them back in if you wish. Pre-heat your slow cooker. I always turn mine on to max heat, while preparing the contents. 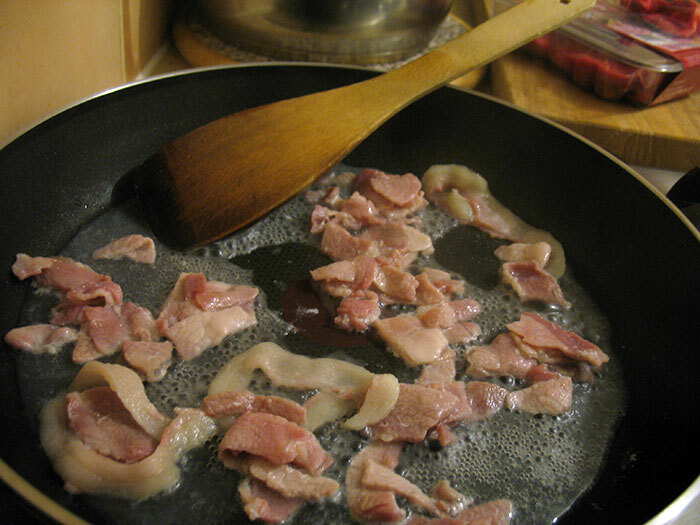 Heat a frying pan under a medium heat and add the bacon and the rind fat with around 30 ml of water. Cook for 5 minutes until the bacon is starting to brown and the water mostly evaporated. Add the bacon, not the rinds, to the slow cooker. With the bacon fat still left in the frying pan place back on heat and add the cubed beef, start to brown. 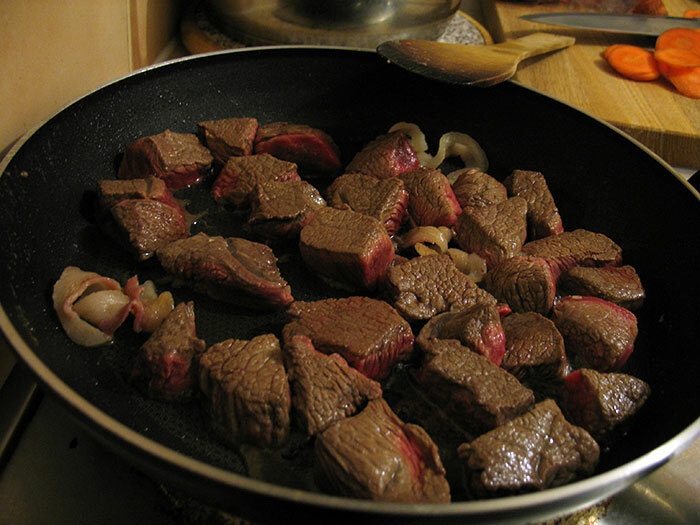 Once the beef is browned all over, add the teaspoon of flour and coat the beef in it. Again add the beef to the slow cooker, leaving the bacon rinds in the frying pan. 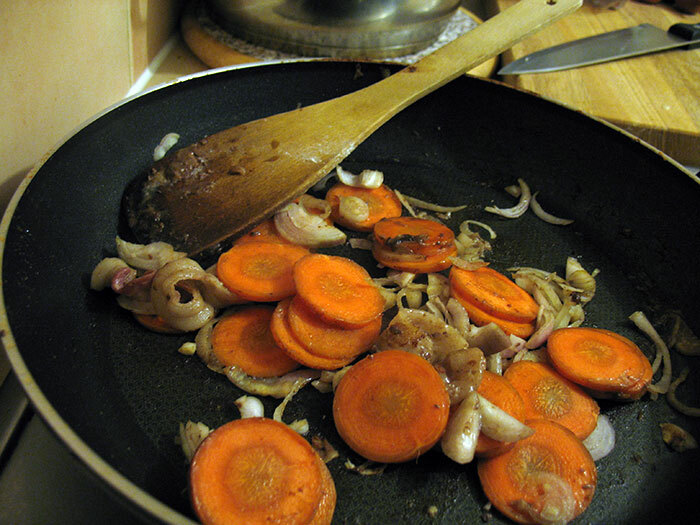 Removing the worst of the leftover flour from the pan, again put it back on the heat, this time adding the sliced onion, garlic and carrots. Cook them stirring to ensure they don’t burn for around 5 minutes. (You can add more oil if you think it is necessary). 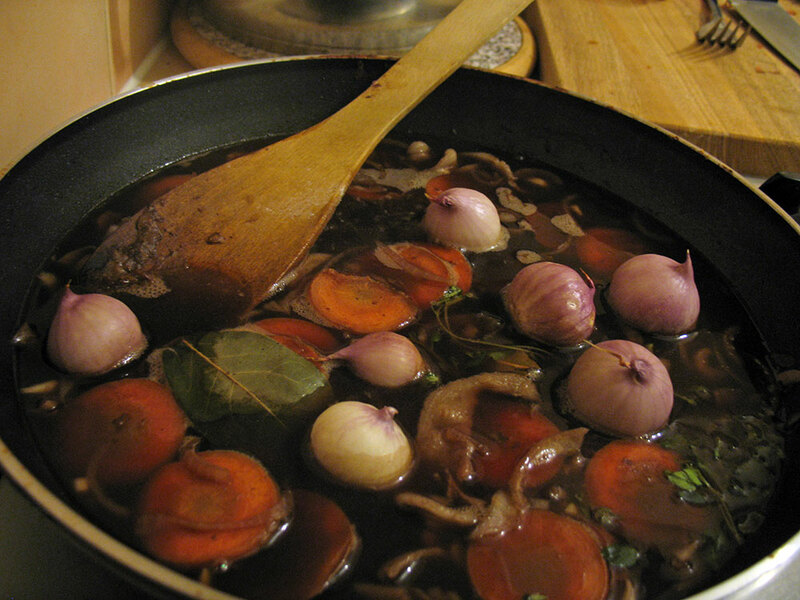 Once the vegetables are beginning to soften, remove the bacon rinds, add the red wine, beef stock, bay leaf, thyme sprigs, small onions, mushrooms and tomato paste. 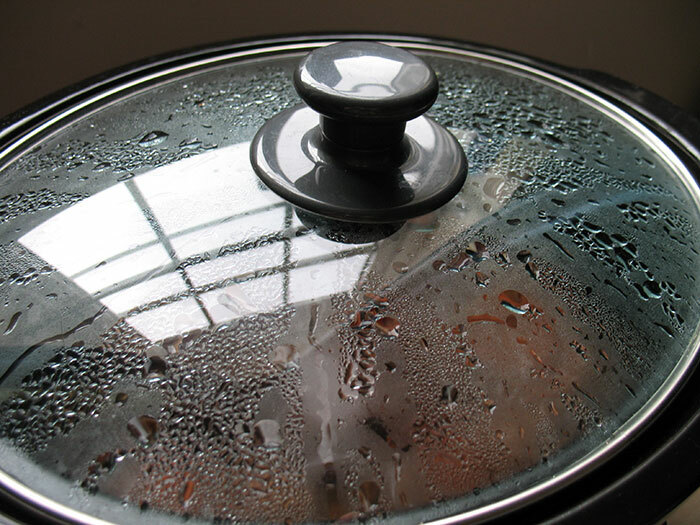 Heat until the liquid is starting to bubble, making sure all your ingredients are hot when entering the slow cooker is the key to using it correctly – especially if cooking at a low temperature. Add the mixture to your slow cooker, turn the heat down to low and place on the lid. Leave for 8 hours. The first time I made this I put it on in the morning before work and left it till I came home, after which I immediately followed with the last section. The second I finally put the lid on at midnight and turned it off at 8 o’clock in the morning. I then left it for several hours before continuing. Once you are ready to eat this dish add the entire contents of the slow cooker to a pan under a medium heat. 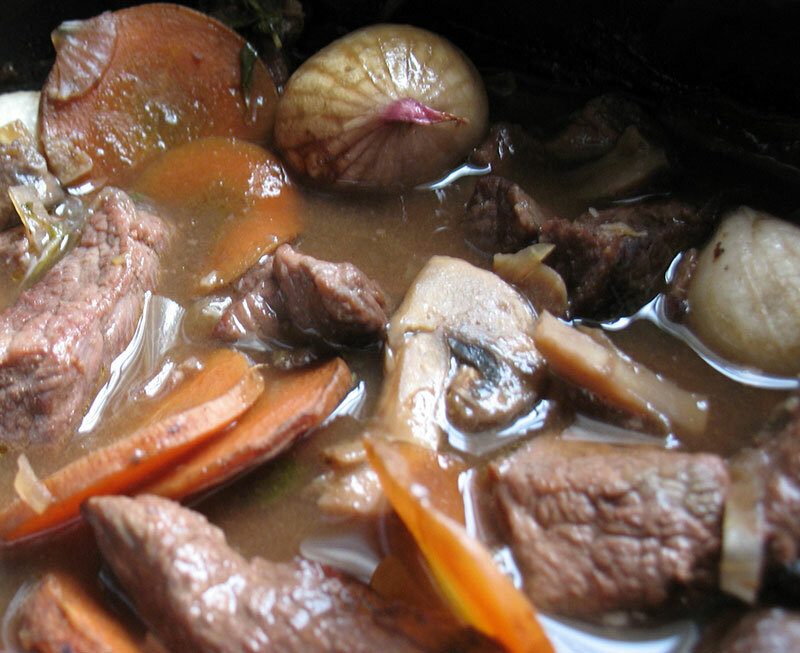 In a slow cooker it is hard to create a thick sauce because no water evaporates (this is why the recipe uses less beef stock and wine than the non-slow cooked version). Twenty minutes in a pan if from cold, and 10 if from heated should be enough to evaporate some of the extra water out of the sauce, if you wish to thicken further remove some of the liquid maybe around 4 tablespoons and add to a bowl, then add the 2 tablespoons of flour mix until smooth and then add back in. Stir the sauce occasionally to keep all the meat and vegetables covered with sauce, so they don’t dry out. Once your sauce is suitably thick and warm, serve, either with new potatoes and veg, or with noodles. I have also tried this with Cauliflower Mash, which was a great low-carb option. There are many steps to this recipe but each individual step is simple, however the resulting dish is wonderfully complex and by far one of my favourite ever slow cooker recipes – if not just my favourite recipe! Yes that’s right this is my favourite ever recipe. Enjoy.